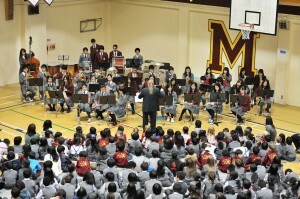 There are two band classes at Marist Brothers International School – the Concert Band and the Symphonic Band. The Concert Band consists of players from Grade 7-9, and the Symphonic Band is Grade 10-12. In both classes, student ability ranges from early beginner to advanced. 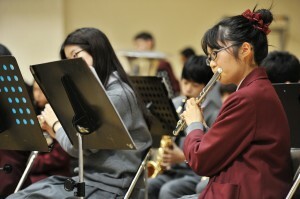 The main goal for all band students is to constantly improve individually and to enjoy successful group performances at school and in public in the Kansai area. Since there are varying levels of performers, many of our performances combine the members of both groups. Last year we had many outstanding performances at MBIS and around the Kansai area and we are looking forward to more great performances this year.